Fort Niagara (1726-1963) - First established in 1726 by the French in present-day Youngstown, Niagara County, New York on the site of earlier fortifications Fort Conti and Fort Denonville. Named after Niagara Falls. Returned to New York State in 1963. Fort Niagara "House of Peace"
The first fortification on this site was Fort Conti (1679-1682) built by the French explorer de La Salle and named after Prince Conti. This structure was destroyed by Indians around 1682 and replaced in 1687 by Fort Denonville (1687-1688). 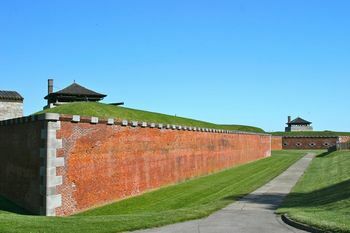 The first Fort Niagara was built in 1725 by the French. It features a large stone building that resembled a French castle but was actually a massive fortification known as the "House of Peace" or "French Castle". At the beginning of the French & Indian War, the French sent a force from Fort Frontenac to upgrade the deteriorating Fort Niagara. The French engineer Captain Pierre Pouchot spent four years converting the post into a significant fortification only to see it fall to the British in 1759 after an 18-day siege. French reinforcements were ambushed by the British and their Iroquois Indian allies just south of the Fort and were defeated at the Battle of La Belle Famille. 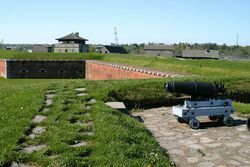 The French garrison was forced to surrender the Fort on 26 Jul 1759 and the British retained control of it until well after the end of the Revolutionary War. 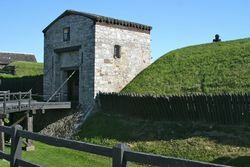 The British held Fort Niagara all during the Revolutionary War and used it to attack settlements in the Mohawk, Schoharie and Wyoming valleys. The war formally ended with the 1783 Treaty of Paris but the British did not relinquish Fort Niagara to American control until the Jay Treaty went into effect in 1796. 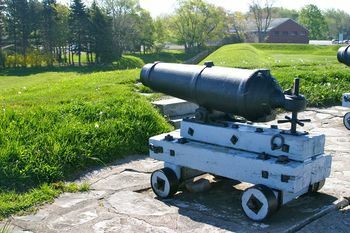 Fort Niagara was re-captured on 19 Dec 1813 by the British during the War of 1812 and they held it until they were forced to cede it in 1815 by the 1814 Treaty of Ghent. In 1841 additional construction outside the old fort walls expanded the size of the post. Fort Niagara was strengthened and expanded during the U.S. Civil War just in case the British in Canada decided to enter the war on the side of the Confederacy. The post deteriorated after the war although it was used briefly during the Spanish-American War. During World War I Fort Niagara served as training post and processing barracks for troops headed for the war in Europe. Old Fort Niagara was restored between 1926 and 1934. The post was again used as training post and processing barracks for troops during World War II. Later in the war, it was also used to house enemy prisoners of war. The post was declared surplus in 1945 and turned over to the Niagara Frontier State Parks Commission. As the cold war heated up in 1953 the post was leased back by the Army to support anti-aircraft units installed around Niagara and Buffalo. Beginning in 1953 these anti-aircraft units were replaced with Nike Missile Systems. Fort Niagara served as a Headquarters for the Niagara Nike Missile Region (NF‑HQ) between 1954 and 1962. The post was returned to the State of New York in 1963 and became Fort Niagara State Park. 1901-08 Capt. Sorley, Lewis W. 3448 See the entry in Cullum's Register. Must See! Part of Fort Niagara State Park, Niagara County, New York. Restored buildings and mounted cannon. Location: Fort Niagara State Park, Youngstown, Niagara County, New York. A Brief History of Old Fort Niagara 84‑pp booklet by Peter A. Porter (1896). Covers the period from 1726 to 1825. Historic Old Fort Niagara 63‑pp booklet by by Claud H. Hulzén, Sr. (1939). Historical background before the fort, then the history of the fort thru the 20c restoration. This page was last modified 21:09, 7 January 2019 by John Stanton. Based on work by Bill Thayer.